Your Customers want eCommerce & your POS systems can't manage the orders. How can you integrate those systems to keep customers and grow your business? TruCommerce is the bridge between eCommerce platforms, POS products, and back office pricing data. The product is designed specifically to empower grocers, wholesalers, and eCommerce teams to deliver groceries and provide click-and-collect solutions to customers, with little or no custom integration work. 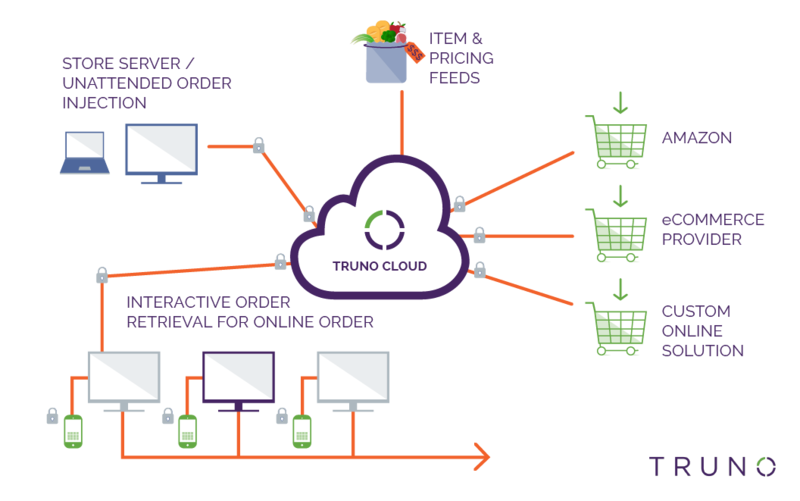 TRUNO’s expertise for the last 39 years in POS platforms, back office products, and internet enabled solutions has led to the creation of the only middleware solution on the market - connecting all of the endpoints together to ensure that loyalty information, data master files, item files, and discounts / promotions are flowing to all areas of the retail business. TruCommerce enables customers to mix and match POS, eCommerce, and back office products in a seamless manner, providing a partner with deep analytics to look at customer spending habits, online shopping trends, deeper marketing tactics, and margin improvement over every aspect of the retail business - regardless of the sales channel. API's and professional services are available where native integrations don't already exist, allowing customers and software providers to push and pull data as needed. Integrate your systems to grow your store by completing the form on the right.